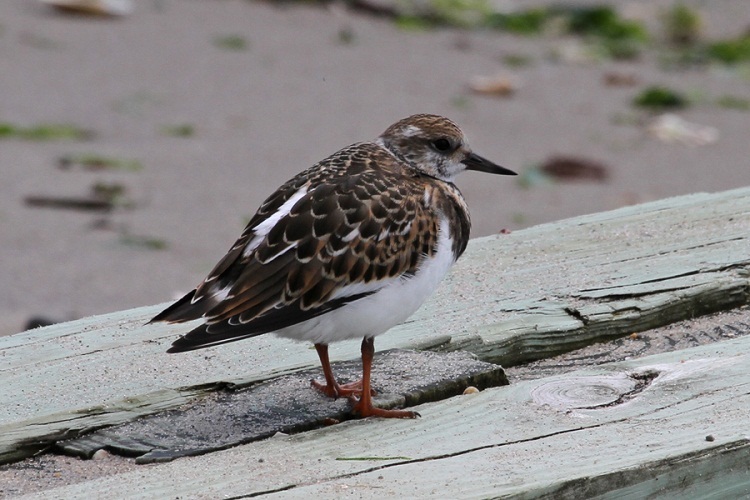 Ruddy turnstones are shorebirds found throughout the Arctic Tundra. It was first described by Carl Linnaeus in 1758 based on an individual he encountered in Gotland, Sweden. 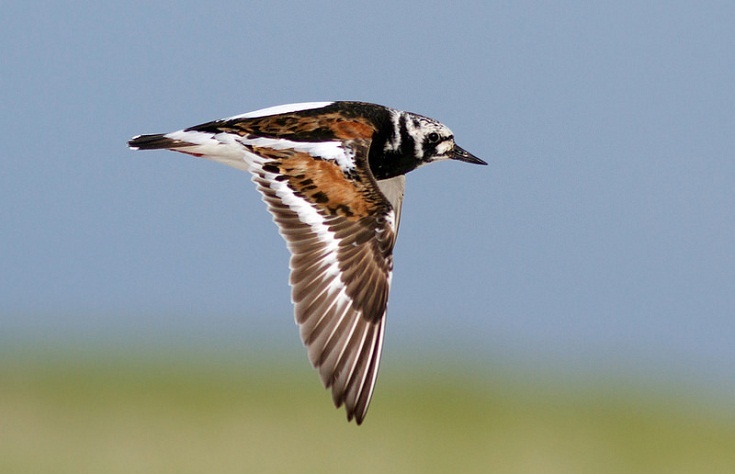 These birds are long-distance migrants. It is alternatively called just ‘turnstone’ across many parts of its range. Size: They are around 8.7-9.4 in (22-24 cm) long. Weight: They weigh between 3 and 5.3 oz (85-150 g). 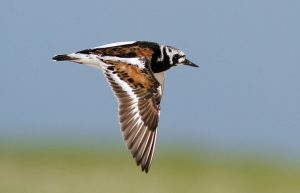 Wingspan: Ruddy turnstones have a wingspan of around 20-22 in (50-57 cm). 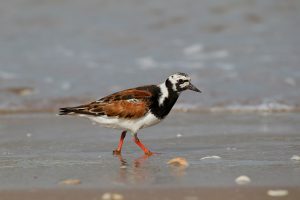 Color: Their plumage is reddish-brown on top with black patterns during the breeding season; the heads are white with a black crown and black marks on the face. The breast is black with white patches near the sides. The belly is also white. Outside the breeding season, the winter plumage becomes duller, with the back being dark gray-brown mottled with black markings, and the head is dark with little black strewn about. The legs of this bird are orange. Their breeding range extends from Alaska, Canada, Greenland, Scandinavia, several islands in the Baltic Sea, Northern Siberia and the Bering Sea. 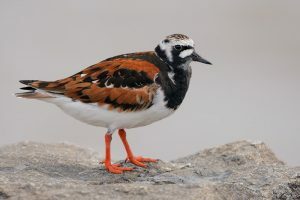 They migrate in the winter to Massachusetts and California, further south into Central and South America, and throughout the coastlines of Europe, Africa, Pacific islands, Australia, New Zealand, and Southeast Asia. They inhabit the Arctic Tundra, mainly rocky coasts during their breeding season and in coastlines during their migration in winter. 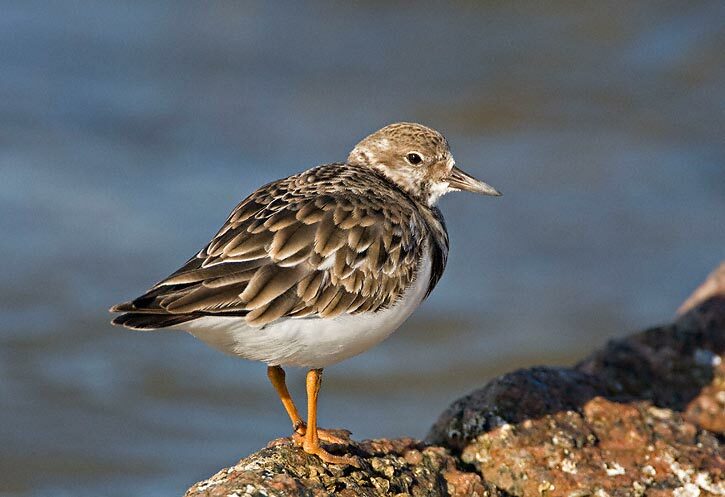 They particularly favor mudflats and sandy shorelines during their migrations. 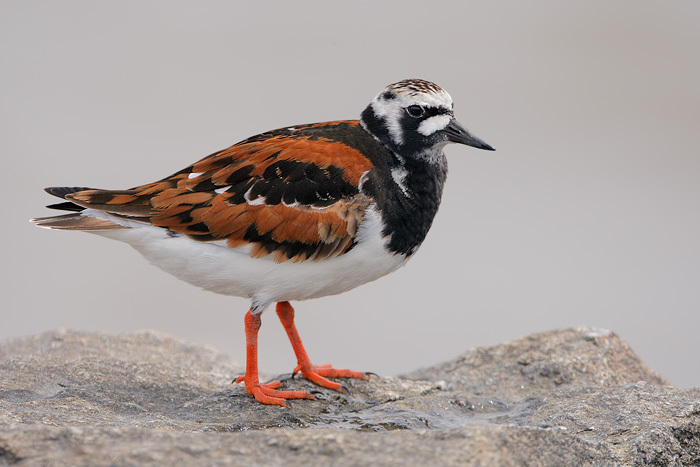 Ruddy turnstones are most active during the day. 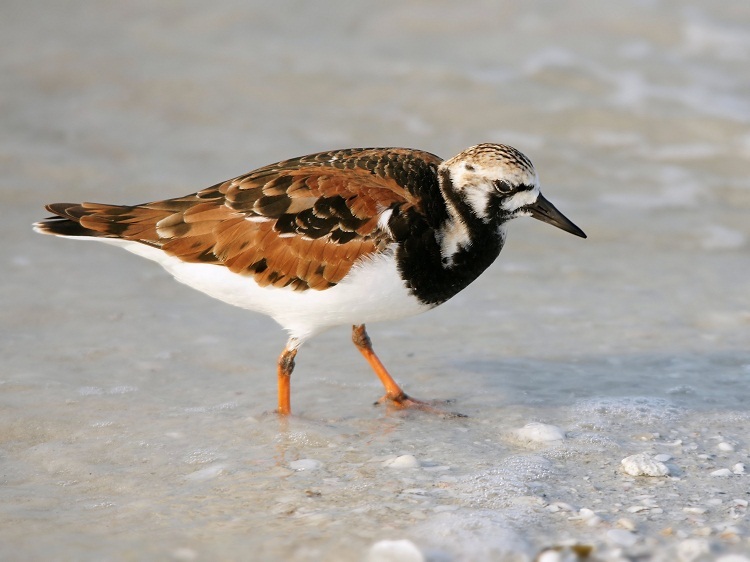 These birds are social, except during the breeding season. 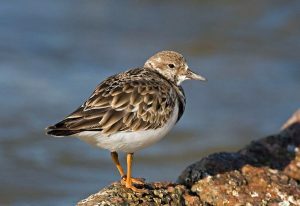 They form groups consisting of as little as ten individuals, to as many as thousands, even including other shorebird species. They become territorial and aggressive during the breeding season. 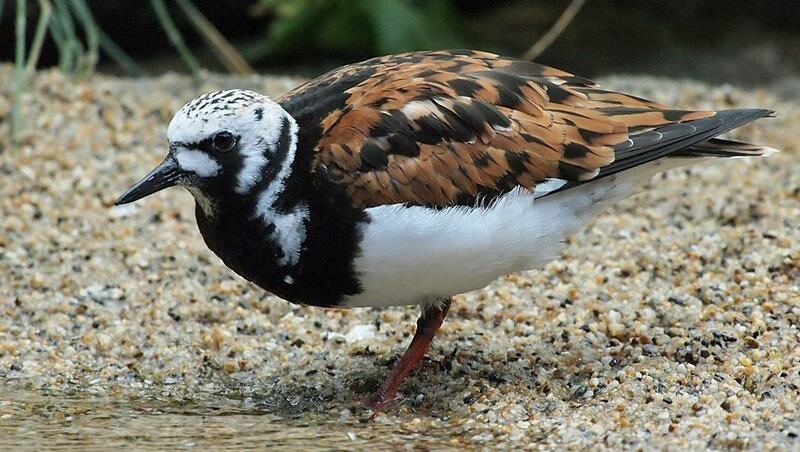 As previously mentioned, these birds are migratory, doing so during the winter in their breeding habitat. 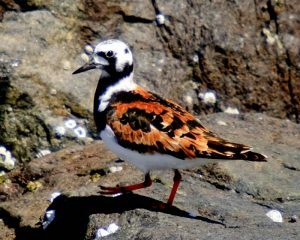 Ruddy turnstones get their name from their habit of flipping over stones and other objects to look for prey possibly hiding underneath it. Their varied diet consists of insects, invertebrates, carrion, plant parts, and eggs of other birds like terns, ducks, and gulls. 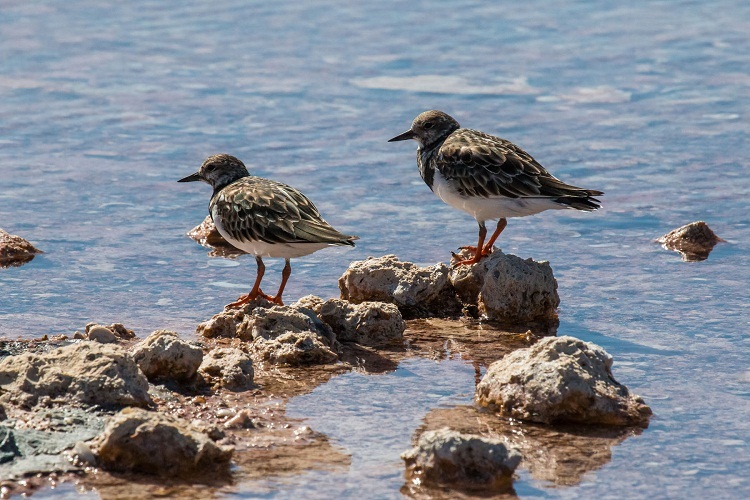 These birds form monogamous pairings. They reach the breeding grounds by May and June and form partnerships within 7-10 days of arrival. They make a nest which is usually just a shallow scrape on the ground, lined with vegetation. Many couples may nest next to each other. The clutch size consists of 2-5 eggs, most commonly though, 4 eggs are laid. The incubation period lasts for 22-24 days and is done primarily by the females, with the males also chipping in towards the end. The hatchlings are well-developed when hatched and don’t take too long to leave the nest after they have hatched. They can feed by themselves but stay in the parents’ care until they fledge at 19-21 days of age. They can start breeding when they are 2 years old, but usually, start the practice when they are about 4 years. The average lifespan for ruddy turnstones is around 9 years. The oldest recorded individual was 19 years and 2 months old when it died. They are a noisy bird, with a ‘kitkitkit’ sound that acts as a contact and alarm call, a ‘pri pri pri’ being used to communicate with the young, a high pitched ‘i i i i’ which serves as a distress call. They also use a plethora of clicking sounds to distract predators, as well as attacking rivals. Since they have to walk on slippery coastal surfaces, their feet are spiny, and the toenails are short and have a sharp curve which gives them added grip while walking on those surfaces. Their strong wings let them be rather swift when in flight and also fly for long distances, upwards of 620 miles (1,000 km) per day during their migration. They fly at speeds clocked between 27 and 47 mph. Parasitic jaegers, long-tailed jaegers, common ravens, glaucous gulls, Arctic and red foxes are known predators of the eggs and hatchlings. Peregrine falcons, Eurasian sparrowhawks, owls, and merlins prey upon the adult, albeit rarely. 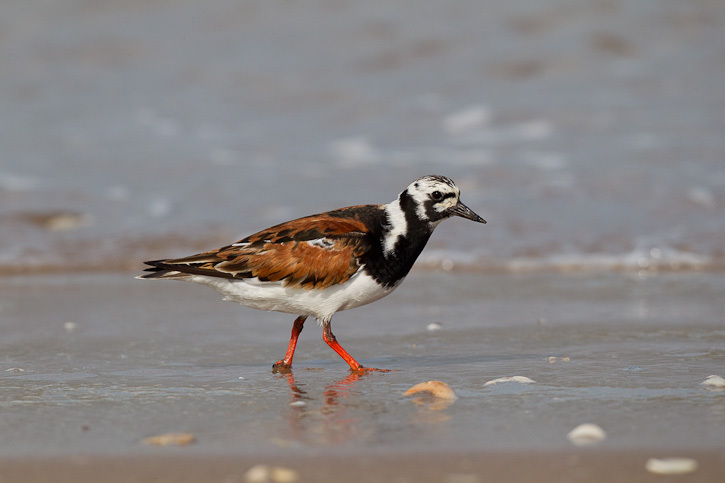 IUCN currently places the ruddy turnstone in the ‘Least Concern’ category. Its wide range of distribution ensures the safety of its population for the foreseeable future. Ruddy turnstones are one of only two turnstone species, the other being the black turnstone, which is also found in North America. They are known as Vuelvepiedras rojizo in Spanish and Tournepierre à collier in French.